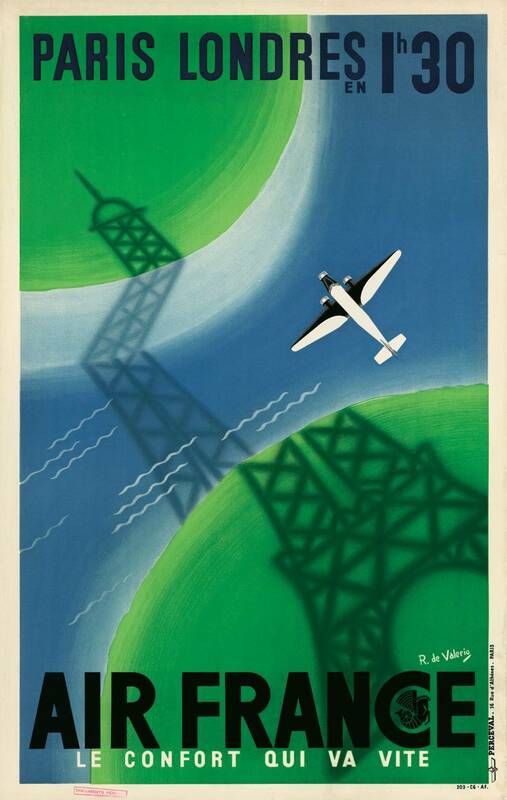 Posters have always played a key role in Air France's communications. With a heritage of over 1500 posters produced by the most famous illustrators, Air France has one of the greatest collections in the world. Sometimes extremely evocative, in other cases more abstract, posters have to be striking, with few or no words and unambiguous imagery – the destination becomes a dream made real, in pictures. In general, posters take one of two formats: small posters of 40x60 cm or larger posters of 90x60 cm. 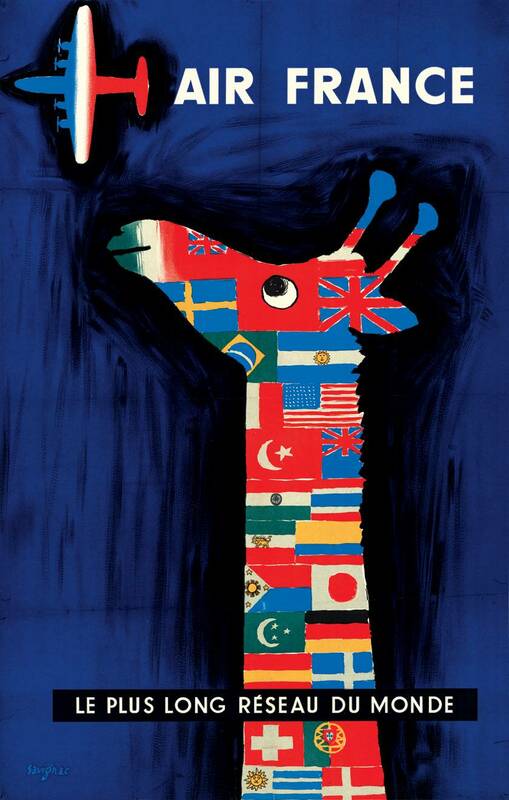 Regardless of time periods or technological developments, posters retain their artistic ability to entrance, bringing glory to aviation's role in globalisation and the increasing closeness between countries, people, and cultures. AAir France played the marketing game, linking its image to French creativity and elegance. Mindful of the impact of posters on brand distribution, the airline agreed to give carte blanche to its designers so they could express themselves freely around the four key elements: the sky, an aeroplane, the nine letters that make up the words 'Air France' and the winged seahorse with the dragon's tail, the logo inherited from Air Orient. In the 1930s, air travel remained the preserve of the privileged few, and Air France's message was clear: it was an invitation to travel. 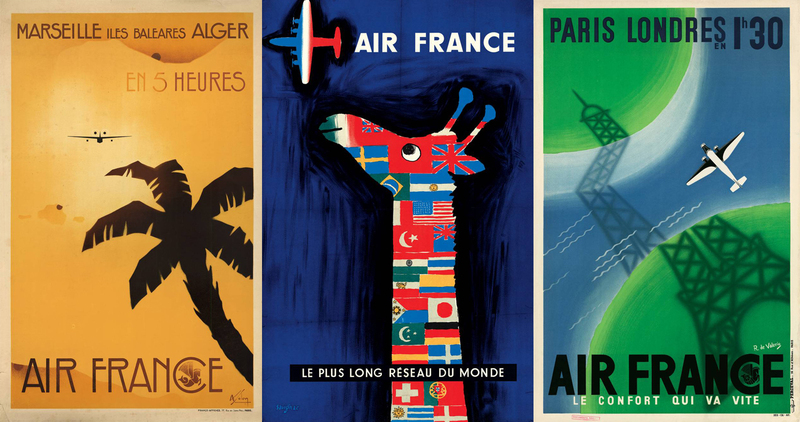 Although Air France called upon the skills of famous poster designers such as Savignac, Solon and Cassandre, for example, the airline also broke new ground by turning to well-known artists such as Cocteau, Mathieu, Brenet, Picart Ledoux and Vasarely. In the 1960s, Air France considered that tourist communications had not significantly benefited from contemporary art and adopted a new strategy. Instead, the airline launched poster campaigns that were generally focused on a single artist: Georget in 1963, Mathieu in 1968, Pagès in 1971 and Bezombes in 1981. 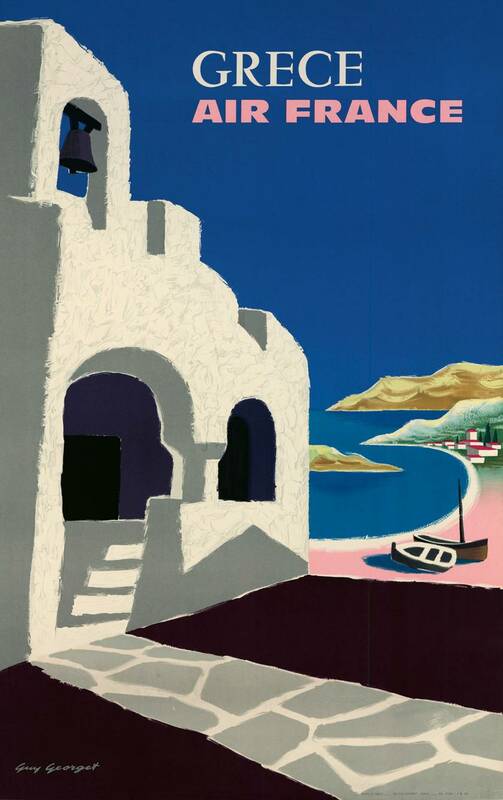 Their posters portrayed the travel experience as dreamlike, with designs that combined art and technical skills, featuring editing and photographic effects. 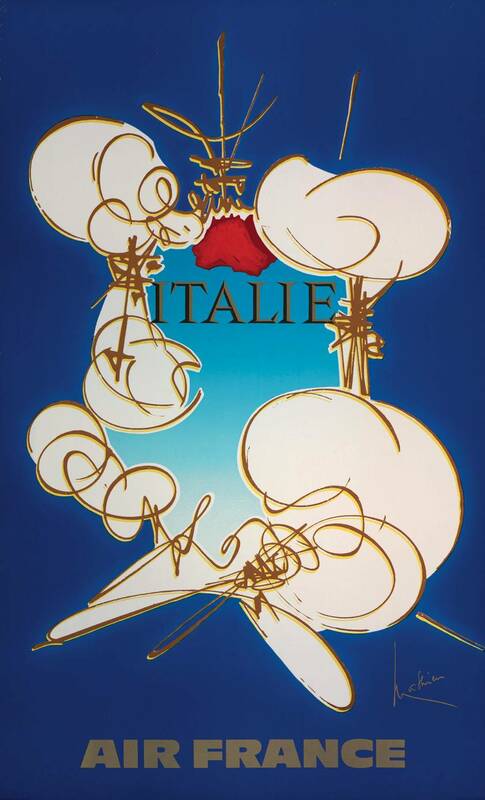 But 'pure' advertising continued to exist – firstly, through Roger Excoffon's images, featuring a dominant sky revealing symbols of the destination. Later, in 1971, Savignac would send a character into the sky: "I fly therefore I am". With the advent of the 1980s and the development of tourism, Air France launched its poster campaign with the new red, white and blue visual identity, adorned with elephants for India, or a Spanish dancer's fan for Spain. Faced with air transport becoming commonplace, Air France worked to create a close relationship with its customers. A new philosophy of travelling took hold: 'Winning the world's heart'. 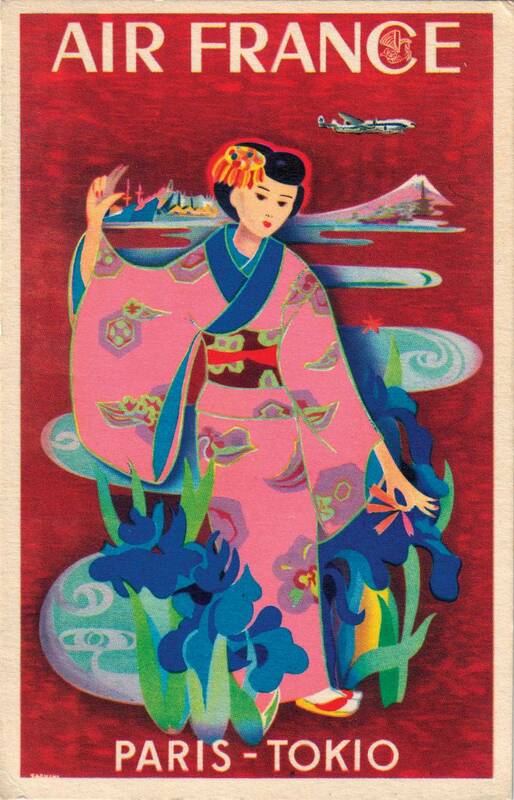 Posters aimed to win over customers, who featured at the heart of its imagery. From 1999, Air France entrusted its advertising campaigns to agencies working with talented photographers. Travel became a kind of space-time devoted to unique sensations. The frenzy of the 1980s gave way to the search for calm, simplicity, poetry, and zen. Under the creative management of Rémi Barbet, the film-maker Michel Gondry and photographers Nathaniel Goldberg, Nicolas Moore, Steven Klein and Christophe Millet created pure, weightless images. The poetic and minimalist message was designed to give meaning back to travelling: 'Making the sky the best place on earth'. The designs featured the tiny aeroplane from the first posters, without which the airline would not exist. In the 2000s, Air France took two approaches: passenger well-being, highlighted in the new campaign given to the photographer Camilla Akrans, and the airline's commitment to protecting the planet, seen through the aerial photos of Yann Arthus Bertrand. Camilla Akrans' lens brought to light the well-being felt by passengers, with their 'dead' time becoming time gained. Her images combine luxury and humanity. Both destinations and services are symbolised by a variety of objects flying through the sky, with the white line of their trail behind them. Yann Arthus Bertrand highlights the beauty and the fragility of the world with photographs taken from the air. 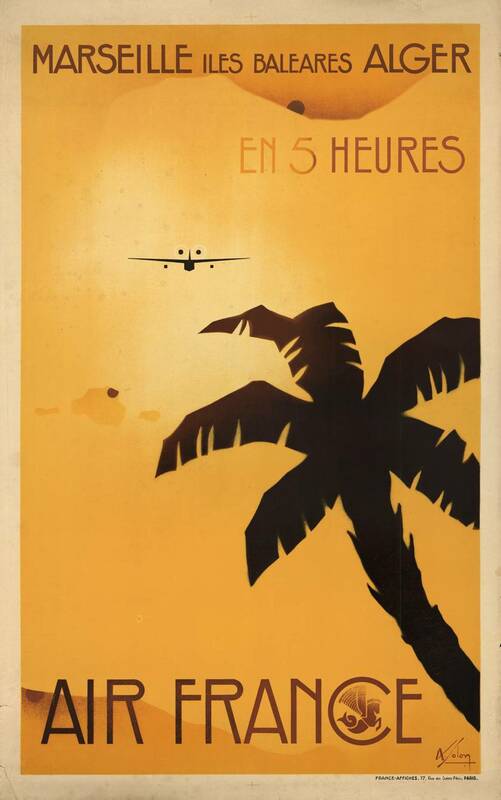 On 2 April 2014, Air France unveiled its 'Air France, France is in the air' press advertising campaign, with posters in 12 countries (France, Germany, Brazil, Canada, China, Spain, the United States, Italy, Japan, Russia, Senegal and Switzerland) as well as online, on social media, and on radio. Created by BETC, this campaign featured 6 images describing the services offered by Air France: the comfort of the A380, the new La Première class, the new Business class, the cuisine, the network and SkyPriority (priority access in over 1,000 airports). It also featured 12 images highlighting iconic destinations served by Air France (Paris, New York, Brazil, China, Japan, Africa, Italy etc.). 'Air France, France is in the air' combines daring and renewal, showcasing the ambitions of the Transform 2015 plan. The images, produced by Argentine photographers Sofia & Mauro, feature a surprising mix of roots and modernity, while at the same time echoing the airline's renowned history of poster design. Pleasure, youth and dynamism shine through with references to the Moulin Rouge, the French Revolution, the Sun King, master chefs and haute couture. The airline's eminently French character and the concept of the pleasure of travelling with Air France are embodied in a joyful, lively and enthusiastic message that chimes with the French joie de vivre and way of life. The light, offbeat tone forges a relationship based on affinity and closeness with the public. Fifteen years after 'Making the sky the best place on earth', Air France adopted a new slogan: 'Air France, France is in the air'. It portrays France as open and international, highlighting the positive universal values associated with the country: the art of living, the unique French spirit, luxury brands and Michelin-starred chefs with a following both in France and abroad. On 8 March 2015, continuing on from the campaign launched in March 2014, Air France launched its new advertising film 'France is in the Air' in France and five other countries (the United States, Brazil, Japan, China and Italy). Broadcast on television channels, in cinemas, via digital channels and on social networks, this advertising spot expressed both the airline's openness to the world and its pride in offering a one-of-a-kind journey à la française – with elegance, inventiveness, and humour. It features the very best of France: a France that is positive, welcoming and inspiring, a shining light across the entire world. A few weeks after its launch, the new Air France advertising film had been seen over 8 million times on YouTube. The biggest names in design have put their talents to work at Air France, bringing aesthetics and prestige to air travel. Air France - a constant symbol of French elegance. There are, of course, well-known connections between Air France and the cinema (Michel Gondry, Hou Hsiao Hsien), design (Raymond Loewy, Charlotte Perriand) and gourmet dining (Paul Bocuse, Guy Martin). But those with contemporary painting are less well-known.